G is for Good ideas – Go for it! Every now and then I get a brilliant idea, so good I wonder on Earth if it was really mine or not. I mean did that morsel of genius just come out of my light box for real? Some people are lucky and brainstorm good ideas constantly but that must be so boring and sooo busy, right? So how about acting on the good ideas? Well maybe this is the part where I have been known to be lazy, or maybe just so pleased with myself with coming up with something so humungously great I bask in my own delight and get sidetracked from the real issue. Get On with It! Mum always said I lived with my head in the clouds and seems it’s a trait I struggle to lose. But I have had some more brilliant ideas recently and some I am going to share with you. I mean I can’t give them all away otherwise there would be nothing to look forward to would there? 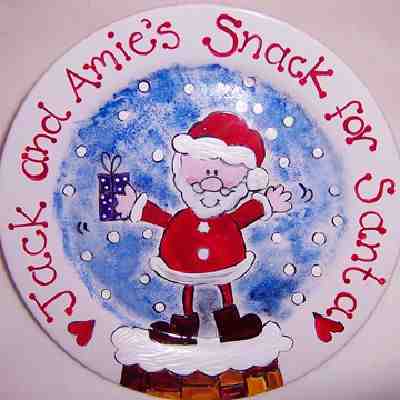 A Santa Snack plate! It brings back every single Christmas Eve I have spent waiting for the man to come by. An excitement so massive I can’t sit down all evening. Every fibre in my body is in movement and my smile is the biggest it’s been all year. A huge tradition in our house has always been preparing something for Santa to eat and drink on his stop (no wonder the guy has such a belly on him – every home in the world does the same!) and of course we never ever forget Rudolph and his fellow reindeer waiting patiently on the roof. Usually a mince pie and a shot of whisky for the Big Man and some carrots for Rudolph and his mates would be ceremoniously placed under the tree in great awe of the magic about to happen. In This House. Another good idea, this time is really mine is to do with the Rowse Manuka Honey I have been sent to consume review. I’m very pleased to have some as both girls are poorly today with high temperatures and runny noses and honey is one of the oldest cures in the book which covers in part the medicinal properties but as for the rest well that’s a secret till further notice. So keep your eyes peeled. And the last idea that I really must share with you as I need a massive boot up where the sun don’t shine. I bought my own domain over two months ago now and atrociously I have done nothing since. I am blocked with fear. So only by making it public and naming and shaming myself may I be motivated to overcome my fear of making a right mess and get on with it. Because that is half the problem sometimes don’t you think, the fear of getting it wrong so maybe it’s better not to try? Well not this time lady. This time you are going to go into your Namesco account and start to see if you will ever fathom out HTML, see if you can make your dream of Mari’s World come true and at the same time anyone reading this be motivated to get on and Go for it whatever their plan maybe. This post is my G (no I didn’t choose spot, far too obvious) for Alphabe Thursday held over at Jenny Matlock’s fabulous blog. I’m dying to see what all the other participants come up with, come on over and have a look! Funnily enough I have already thought about Christmas 2010 already this year and that happened to be when we cleared out the loft and I came across our decorations, it occurred to me, along with a smile, that I would be putting them up in a new house this year and there the thought stopped. Phew! Not only that but every year when the sun is beating down and I’m lying on a beach somewhere, my thoughts ALWAYS drift off to Christmas. Likewise on Christmas day when I’m surrounded by my loved ones and about to crack open a decent bottle of red to wash the turkey down I think of the summer and hot days and nights. It must be because they are both my favourite times of year and things I look forward to on the calendar. So I thought I’d dedicate a post to these thoughts and ask you. Have you caught yourself thinking of Christmas 2010 yet?